Think of some of your favorite classic video game puzzlers. Now imagine if they were all one game. That’s the developer’s approach to design with Wild Wilf: take the proven mechanics from several hit games of yesteryear and reconstitute them into the videogame equivalent of an everything bagel. 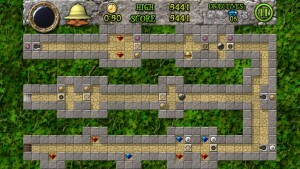 Imagine Sokoban meets Boulderdash meets Minesweeper, with a Montezuma’s Revenge aesthetic. Now picture a “turn the tables on your enemies” element, like Pac-Man eating a power pellet. Congratulations, you’ve just envisioned Wild Wilf. The titular Wilfred Wilde1 has embarked to the New World on a treasure hunt to restore his family’s depleted fortune, in an effort to pay off debts and adequately provide for his sweetheart Marigold. It’s a cute but sparse bit of backstory in the typically plot-starved genre of puzzle games. 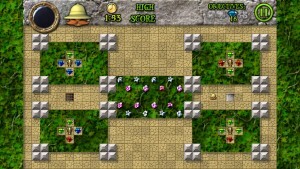 The jungle aesthetics of the game are pleasing, with a decidedly retro style. I played Wild Wilf mainly on an iPhone 5, whose aspect ratio is thankfully supported by the game. On the flip side of that coin, the individual tile graphics of the game are extremely small. This makes some of the functional tiles difficult to tell apart, including ones that can get you killed if used in the wrong way or at the wrong time. Playing on an iPad is much easier on the eyes. An unusually long tutorial is used to explain the many ingredients that have been cribbed for inclusion into the game. 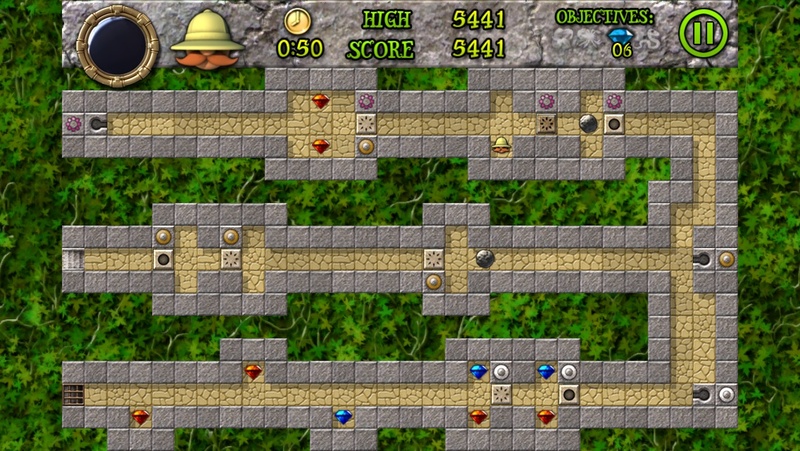 Each level of the game involves reaching an exit, with varying combinations of obstacles thrown in your way, and often requiring the collection of items on your way. The game initially appears to be turn-based, but a few of the hazards move independently of your own movements. One type of enemy even follows your movements at a fixed pace. There’s also a time limit on each level, with bronze, silver and gold medals awarded for reaching the exit in progressively shorter amounts of time. While this is a common practice in many games, particularly on iOS, the lack of iCloud progress syncing can be annoying if you’re going to be playing on multiple devices. The omission is disappointing, especially for a universal app. Also lamentably absent is Game Center integration of any kind. No leaderboards, no achievements, so your bragging rights extend to whoever’s within earshot. Wilf can move up, down, left or right via an incremental, “one step per swipe” movement scheme.2 While this degree of precision is necessary for some of the game’s more intricate sections, it can be downright cumbersome on the more wide-open levels. The movement scheme also unnecessarily extends beyond the core gameplay and into the menu interface. Why should the player have to swipe twenty times to scroll through a list of as many levels? At first I was quite put off by the inclusion of a time limit. I wanted to be fair, so I approached the game on its own terms. The App Store description touts its “mix of arcade and puzzle gameplay,” so it’s clear that developer Bleepy Toy was going for a hybrid style of game. 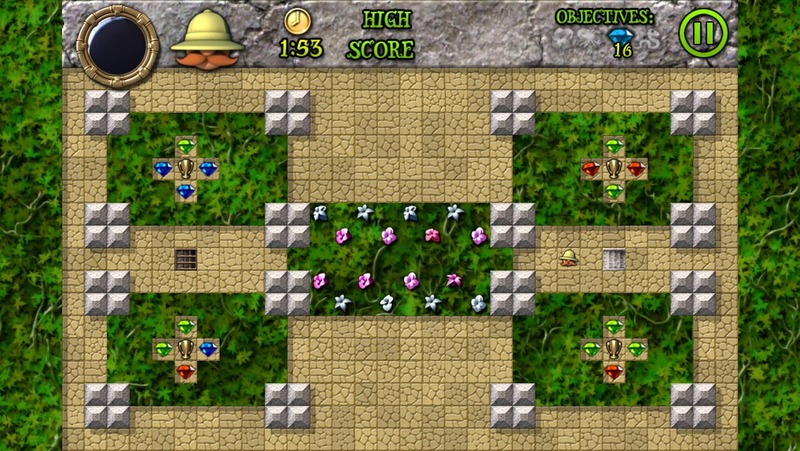 The conglomeration of different puzzle game mechanics can also be an acquired taste. Whether or not it works for you will depend on a few things. Is the decathlon your favorite Olympic event? Did you enjoy such supergroup charity songs as “We Are the World,” “Voices That Care” and “Do They Know It’s Christmas?” This game is to puzzlers what the Super Smash Bros. series is to fighting games. If I had to compare Wild Wilf to a single game, it would be Adventures of Lolo. And much like that 8-bit classic, Wild Wilf is by turns frustrating, delightful, and challenging. 1 No relation? Wilfred Wild (1893 – 1950) was a British football manager who served as manager of Manchester City from 1932 to 1946.